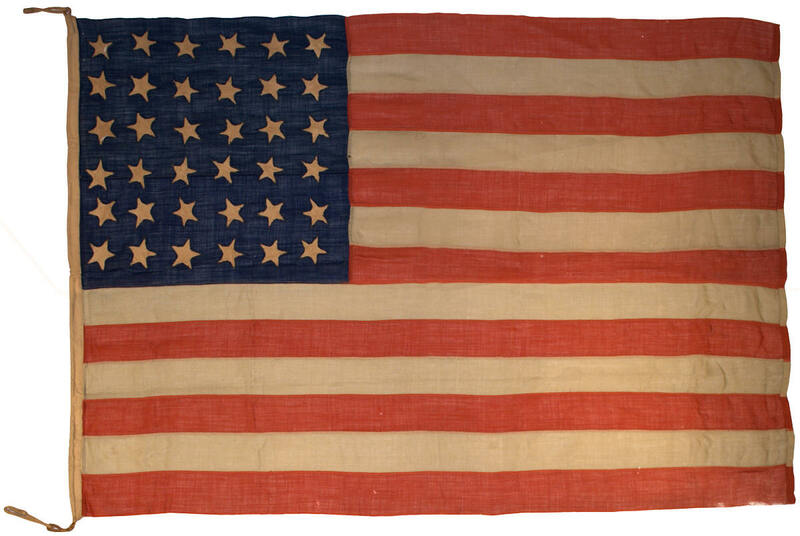 This flag of 36 stars is typical of those manufactured during the time of the American Civil War and the period of reconstruction that followed. The flag is beautifully preserved and in exceptional condition for a flag of the period. The blue wool bunting of the canton and red stripes remain vibrant, and the white stars have turned a uniform cream color. The fly end of the flag is nearly completely intact, with only the slightest fraying at the bottom right corner of the flag. Although the stripes are machine sewn, the stars of the flag are hand sewn, and are single-appliqué, which means that the stars are made from a single piece of fabric applied to the canton, which is cut through in the shape of each star. In this particular case, the "back" of the canton, where the stars peek through, is actually what we typically consider the "front" of the flag today. Although the back of the flag would appear to be more finished, the front of the flag, where you can see the handiwork of the seamstress and the irregularity of the stars, presents a beautiful and folky appearance, and a provides the observer with a detailed look at this type of construction in early American flags. The hoist of the flag is a sleeve hoist with its original hemp rope passing through it. Overall the flag is a very fine and beautiful example of a late Civil War era American flag.